It is with pleasure that I sit here in our warm living room, with the fire roaring on this cold June afternoon. Firstly I would like to thank all of you on the Committee for all your hard work over the year. Especially Maureen Kirby, our Southland Specialist Nurse, for raising a lot of money by producing and selling calenders for four charities, one being Scleroderma NZ (we received $900) and Linda Bell, from Scleroderma Waikato, for her great effort of another movie night charity raising $800 for Scleroderma NZ. Also many thanks to all of our members who have donated terrific sums of money to our society. These efforts are very much appreciated. Thank you to Barbara and John Spavin for the great informative newsletters and website that keep us connected, and to Cushla Marsters for running Scleroderma NZ facebook page, a very good job well done too. Also a big thank you to Carolyn Barkhausen for organising some great bumper stickers for us to put on our vehicles. I must say they stand out and are very useful when I am searching at the supermarket car park! donations as part of our annual appeal on the 29th of June 2016, or at any other time. I have approached a large number of companies throughout New Zealand for financial support and so far I haven’t had any luck. Gordon and I met with Ken Scott the New Zealand representative for Acetelion Pharmaceuticals late 2015 and unfortunately his company cannot support Scleroderma NZ now. However, I was fortunate to receive a large number of prepaid envelopes from NZ Post for our Booklet project. We have established a Logo which is very bright and cheerful which was developed by Jago Print in New Plymouth. The main project now is to develop a New Zealand Edition of Understanding and Managing Scleroderma. It is almost ready for printing, and with the very kind donations from the above we will be able to print around 1,000 copies and send to those of you who wish to receive a hard copy. It has been a busy year, for a number of groups around the country, starting from the deep South. After many attempts I was able to get a group started in Christchurch with the help of Arthritis New Zealand and one of our committee members, Kim Tocker, who helps run the meetings. The Rheumatology Nurse, Jan, has also been a great help at informing patients in the area, so they can attend. There are quarterly meetings alternating between talks and get-togethers. Held a national seminar in May 2015, with a good attendance and informative speakers, an art exhibition to raise awareness and funds for Scleroderma NZ in June. We also have quarterly meetings, with a speaker at every second meeting, and a social get-together at every other. We will be having a get-together lunch out for World Scleroderma Day on the 3rd of July. Have get-togethers though out the year and generally make it down to Wellington for the talks and seminars. Hamilton, this year in November. Linda works very hard at fund-raising and does a terrific job, a big thank you to Linda, for all her support of Scleroderma NZ. Allan and Sandy Edmondson run the New Zealand PAH group, meeting, with welcomed scleroderma patients, every couple of months. Allan will be running a seminar later in the year for the PAH sector, a big effort from Allan and Sandy, they are both extremely generous with their time and kindness towards people. Gabrielle Conway, our treasurer, has just set up an Auckland facebook page to bring people in the Auckland area closer together. This will help those who cannot get out easily to have contact and perhaps a coffee meet and greet at sometime in the future. A terrific idea, and it looks to be running very well. Media Coverage took a quick swing in February this year when Tina McLean from Wellington took centre stage on TV 3 with an interview on how difficult it is to deal with packaging when you have a disability with your hands. Tina talked about scleroderma and did a very good interview. This interview was held as part of a campaign by Arthritis NZ about the dangerous and poor packaging we all have to deal with. As mentioned earlier about Maureen’s Calenders, it was a huge effort, a lot of red tape to go through, and the producing of the calenders along with having to sell the great lion’s share of them. Maureen did all this while holding a specialist Rheumatology Nurse position at Southland Hospital and running a family, and I’m sure numerous other tasks, a huge effort. These calenders generated an interview with the Southland Times where Maureen brought about awareness for scleroderma. This was on the 21st of December 2015. Kapiti Access Radio interviewer Sandra Forsyth, one of our members, interviewed Adrienne Burleigh, one of our committee members, about scleroderma. It was a terrific and a very well thought out interview. This was on the 24th of June 2016, to raise awareness for World Scleroderma Awareness Month. Arthritis New Zealand held a workshop for volunteers who would like to be contacts for newly diagnosed people with arthritic conditions. It was great to see three of us from Scleroderma NZ attending, Linda from Palmerston North, Nicky from Christchurch and myself here in Wellington. We will be the first contact people for anyone with Scleroderma who is newly diagnosed that contacts Arthritis New Zealand. 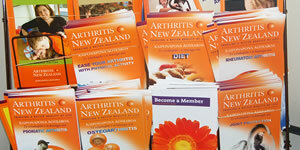 Arthritis NZ has 15 educators to cover all of New Zealand, so volunteers have become a valuable asset to their society. We are not expecting a lot of patients to come our way, but we will be ready and waiting to guide and help them. We fulfil this service for Scleroderma NZ through our web site also. Whether you are newly diagnosed or not, you are very welcome to write into me diannepurdie@xtra.co.nz or phone 04 479 5548 for any help or advice you may need, or just a listening ear can help big time too. To end this report I wish you all very well keep your core warm it is most important!!! And thank you all for your support.